The London College of Garden Design (LCGD) has experienced its fastest full enrolment onto its one-year Garden Design Diploma since the College was first founded. The College has recently launched a new series of films from graduates including RHS Young Designer of the Year 2018 Will Williams, They talk about their experience post graduation and about what LCGD has done for them in launching their careers. In the College’s 10th year graduates have had unique access to several graduate competitions especially run by the College for them. These include high profile projects on the South Bank and at The Savoy Hotel in central London as well as RHS Chelsea Flower Show exhibits. Fisher Tomlin said, “In addition to our main Garden Design Diploma the college’s Planting Design Diploma, now in it’s 4th year, has become an essential course for many wanting to explore this subject in more depth and we are seeing an increasing number of graduates from other design schools enrolling.” Enrolment for this unique course is now open for commencement at the end of January 2019. The College will be at The Landscape Show in Battersea Park next week with 8 free seminars offering a taste of the college’s courses to new and experienced garden professionals. 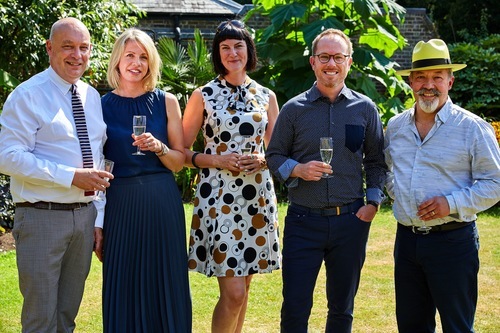 The image shows 2018 graduate prize-winners Linda Stokes, Amanda Grimes, Colm Joseph with College directors Andrew Fisher Tomlin and Andrew Wilson. The College is one of Europe’s leading specialist design colleges and offers professional level courses including the one year Garden Design Diploma and a unique Planting Design Diploma delivered over 5 months. Both courses are taught from the College’s home in the world famous Royal Botanical Gardens, Kew. In 2018 the College has awarded 4 bursaries to celebrate its 10th anniversary. Over 50 applications were received and the awards made to students on the basis of financial need and horticultural experience.